Impact Wrestling announcer Josh Mathews, after a sudden turn of events, finds himself in possession of the Grand Championship. 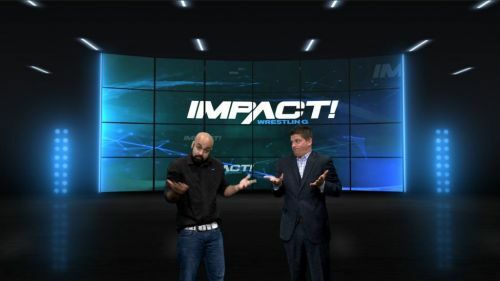 We caught up with him and discussed a plethora of topics about everything Impact Wrestling. In case you missed the first part of our interview, you can read it here. Presenting the remainder of our in-depth conversation with Mr. Josh Mathews. Who are some of the homegrown talents in this current roster that you'll be focusing on? Josh Mathews: I think there are a lot of opportunities for talents to succeed going forward. Again, as one person leaves that opens up the opportunity for another person to step in and step up. That's not to say that the current roster hasn't done that. That's not to say that the current production team hasn't done that. But it's an opportunity now to be noticed more. If the pool gets more and more shallow and if there are less and less people in the pool, it's an opportunity for somebody to go- 'Oh, I like what that guy is doing.' And that guy may be thinking- 'Hey, I've been doing this for years'. But now there's nobody in the way. To give you an answer of names, I don't want to do that because I want to see who gets looked at, who gets noticed now that people like EC3 aren't going to be there and who fills those voids and who I'm clamoring to see on TV, for the next six, seven, eight months. What's your personal take on Austin Aries coming in and winning the World Championship in a minute? Eli Drake was an incredible champion in my opinion. Josh Mathews: Yeah, I think Eli Drake was a great champion. And I think Austin Aries coming back and winning the championship in a minute, it should make Eli Drake upset. And it should make Eli Drake compete for that championship even more. When you look at the current situation revolving around the World Championship, you know that at Redemption on April 22nd, you're going to get a first time ever match between Austin Aries and Alberto El Patron. We just had a first time ever match between Austin Aries and Johnny Impact that was a great match. You have all these guys vying for the opportunity to become World Champion. Eli Drake may find out that he's got a briefcase with a contract on Thursday, as the result of Feast or Fired. So he could get right back in the hunt. Did I think Eli Drake was a great Champion? Yes. I think Austin Aries is also a great champion. I think Alberto El Patron will be a great champion. I think Johnny Impact will be a great champion. So, you have different opportunities with different guys and we'll have to see who holds on to it the longest. It's a lot of fun as a viewer. Absolutely. What's your take on taking the Eddie Edwards controversy and making it this full-blown storyline that the whole world is talking about? Josh Mathews: A miracle happened and other than breaking his orbital bone, and shattering his nose and all that blood, Eddie is going to make a full recovery. Eddie is going to have 100% vision. He's going to be just fine. And honestly, what transpired, it wasn't taken by Impact as 'Okay, we're going to go full on with it'. What actually happened, that is Sami Callihan picking up a baseball bat and smashing Eddie Edwards' face, that was picked up by media outlets. Sami had an opportunity to apologize. He didn't. He said how he really feels. This isn't ballet. This is a physical, violent sport and he took a baseball bat and smashed a man's face in. Eddie's had an opportunity to speak about it. We're just kind of watching as the story unfolds. I can't wait to see what's going to happen. I can't wait for WrestleCon. I can't wait for April 6th for Eddie Edwards to get his redemption on Sami Callihan...excuse me, Jeremiah Crane. Eddie's got a chance. This is a brutal world that we all decided to be a part of. Brutality is going to play out at its finest on April 6th. What's the best match that you've called in your career? Josh Mathews: There have been so many matches in my career that I've called. At this point in my career, I've been doing this for so long. I have personal relationships with so many wrestlers and athletes. It's always special for me when I get to call one of my wife's matches. Madison Rayne. A husband calling his wife's match. That does not happen very often, if ever. I have to choke back emotions when I'm calling her matches because she's so talented, so gifted, so good. Those are the ones that stand out to me. The ones that I have a personal attachment to. I've spent so much time with our talent. Eddie Edwards. I consider him a great friend. Once you get that attachment to a character or person, it turns your call up a thousand notches. During a recent Impact teleconference, you mentioned that Ed Nordholm was in India recently. What was the purpose of the visit? Can we expect something special? Josh Mathews: The trip for Ed and Sonjay was a business trip. Just like they make their trips to the UK. It's nice to get in the same room once in a while. Have those conversations. To me, it's an opportunity to think about when we will go back. I hope we do. I hope it happens soon. I had a great time in India. I loved being over there. I'm not someone who likes to fly. I spent 26 hours in the air. To get over and the way that you guys treated us, it's a trip that I'll never forget. A trip that I'll tell my grandchildren about. Just so much fun to be over there in Mumbai with all of you. And again, the hospitality that you guys showed us was extraordinary. I cannot say enough good things about India.